Dude, super write up, great pics and accurate! thanks!!! I assumed my CTS needed replaced based on the P2181 but after changing it out, the same code again has reappeared; therefore i will change out the thermostat. Have you done this yet and or is there a write up you can show me or provide the link for a DIY? Rich: Yes I replaced my thermostat a couple months ago so it fresh on my mind. Happy to answer any questions or help out where I can. It was basically my first (other than the CTS) DIY I've ever done so you can definitely handle it. Not too bad, but takes some patience. Try the link below. Its for a A4 1.8T but its pretty similar. 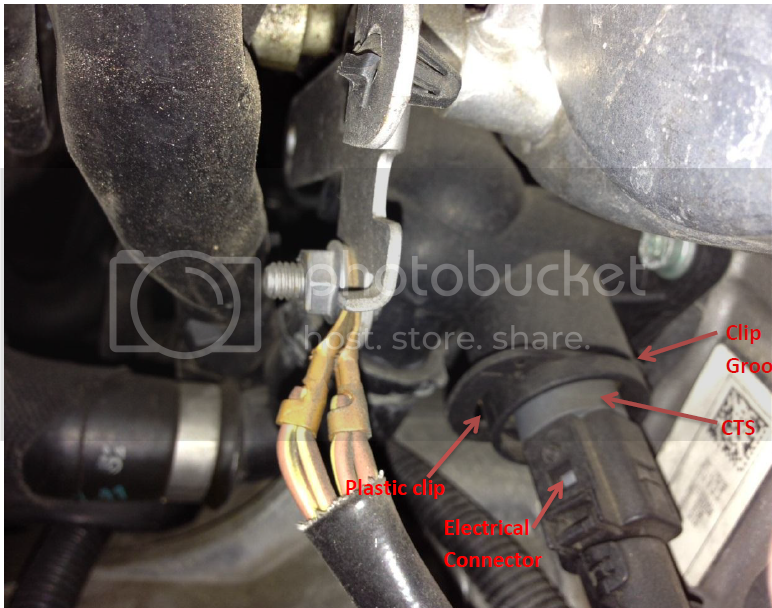 (6) you might need a buddy to get the bottom quick connect hose off. We used a rubber mallet/hammer and a screwdriver. One guy held the quick connect hose, other guy tapped the top of the connect with the screwdriver/mallet until it finally popped off. This is probably the only semi-difficult part about the job. (7) drain your coolant before hand. (8) a torque wrench is a "nice-to-have" for installing the new thermostat, but not totally required. (10) might need to replace the O-ring on the middle hose. I think its this Home Page > Search > N90316802 > ES#264172 Sealing O-Ring - Priced Each (19.6x3.6mm) - N90316802 but I'm not totally sure. Hope this helps. Feel free to PM me if you have any other questions. Holy crap, I don't think i want to do this. I saw another vid of a dude replacing his thermostat on a 1.8 also but it was a more traditional thermostat than what i just viewed, and it was located near the bottom of the block near the radiator; and it looked rather easy unlike this large thermostat housing. To each his own. Like I said, I did it with zero experience so it's certainly doable. I got a quote for $500 from my mechanic to do the job. CTS is a good first part to throw at P2181, but it's more likely a thermostat with that code. I had my temp sensor replaced, but the code came back, so I got a local German specialist shop to do my t-stat for about $350 (well worth it considering the part is about $80 and it would have probably taken me all day to do it). The dealership quoted me $500 and I laughed at them. Thanks for the great instructions and photos. One thing I want to add is about the O Ring. 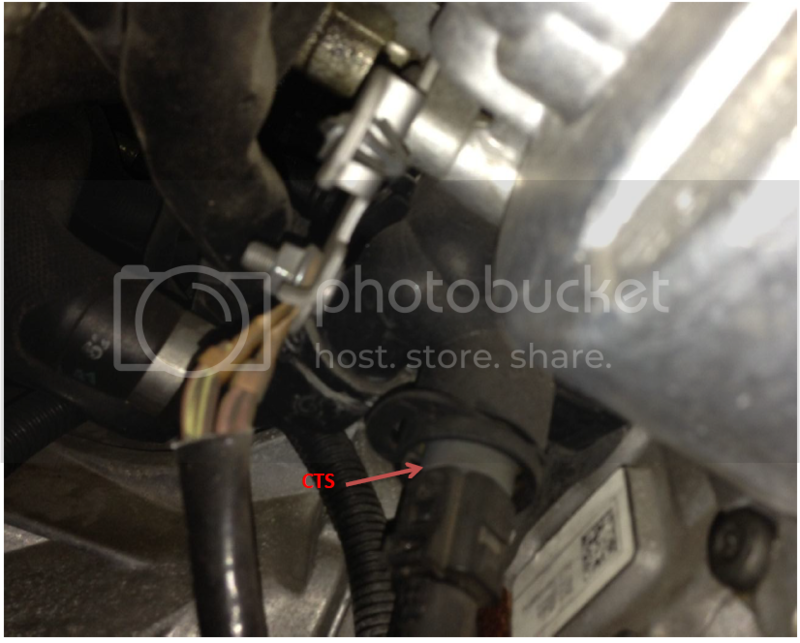 Once I pulled out the sensor and the coolant started to flow.. I noticed the O Ring was not on the sensor. 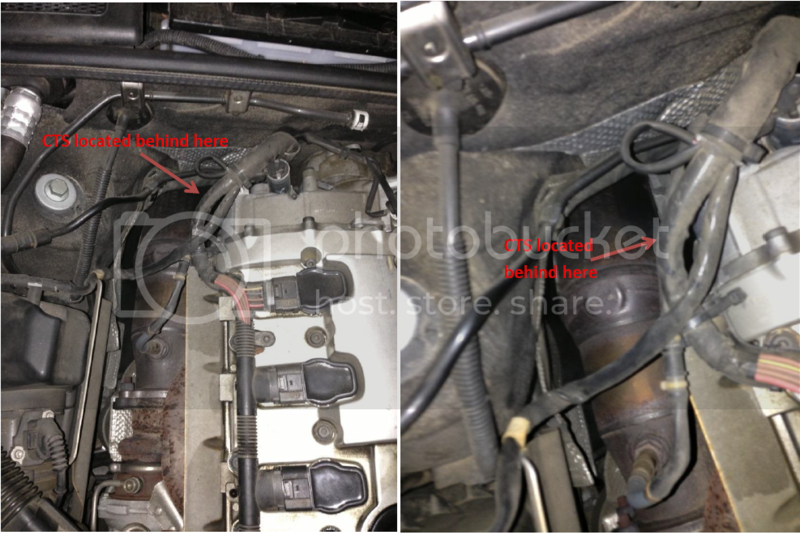 Before searching all around the engine compartment, I stuck my finger up in where the sensor goes. The O Ring was stuck up in there still. I'd recommend checking to make sure it's not in there, when putting the new sensor back in. I'm assuming with double O Rings, it'll leak, and you probably won't even get to put the retaining clip back in place. Very easy process. Took me literally 8 minutes. That's a great write-up, thanks. Do you know if the cts is accessible from below? I wasn't able to access from below but I also did not have a lift and it was my first DIY. Good luck! Thanks! I wish I had a lift! I'll drive it up onto ramps and see how that goes.